Japanese novel Harmony is a believable, satiric tale of a false Utopia ruled by "benevolent" health organizations devoted to disease-free life. Until a rash of suicides reveal a conspiracy to exploit this supposedly-perfect system. Published in Japan in 2009, Harmony was released for the first time in English this year from Haikasoru. 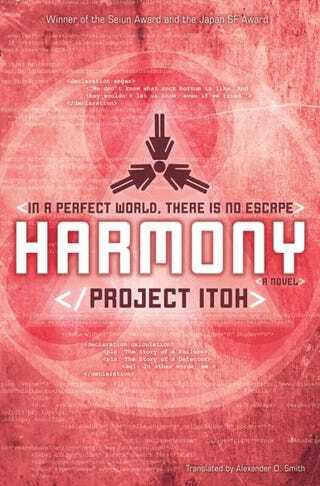 It's the last work by the celebrated scifi author known only as Project Itoh, who wrote it while dying of cancer. That biographical detail suffuses this novel with a weird darkness, since the entire story focuses about the suffocating kindness of an international medical system devoted to maintaining the perfect health of every citizen. After suffering through a nuclear disaster called the Maelstrom, the world has found peace by replacing state governments with a set of international health organizations that keep everyone completely disease-free and healthy by implanting them with personal nanobot swarms called WatchMe. We learn about this near-future Earth in a first-person account written partly in an HTML-like "emotional markup language" by Tuan Nihie, a rebellious member of the World Health Organization's special forces unit. Growing up in Japan, Tuan comes to think of WatchMe as just one piece of a system that demands complete conformity. To prevent another Maelstrom, people in positions of power have interpreted "health" broadly, using it to justify everything from censorship and drug therapies, to blandness in diet, so that people won't become agitated. The problem is that WatchMe can be hacked, and its healing properties turned inside out. Called in to investigate a rash of suicides, Tuan begins to suspect that a childhood friend she believed dead is behind a conspiracy to hack WatchMe in ways nobody knew were possible. As she gets closer to figuring out why thousands of people committed suicide at once, we learn about all the ways she and her friends have tried to subvert the medical-industrial complex – and why "perfect health" can be a horrific fate. Action-packed, darkly funny, and philosophical by turns, Harmony is a suspense yarn that's ultimately about the nature of consciousness itself. It's also a just-plain-awesome medico-science thought experiment about what the world would be like if life-extension technology became a reality. Laced with dozens of cultural references – everything from Max Headroom to Nine Inch Nails – Harmony will feed your brain and undermine your faith in Utopia. If you want to know what the transhuman future will really be like, or just want to read a ripping good nanotech thriller, put Harmony on your reading list. You can pick up Harmony online, or at your local bookstore.